There is nothing quite like growing your own great-tasting produce: the freshness of what you harvest, not to mention the satisfaction of having grown it, along with getting a bit of healthy exercise thrown in. We are lucky enough to have a greenhouse so we are already picking tomatoes and cucumbers. A greenhouse or conservatory means you can plant at the end of March or early April. In a sheltered position outside, it would be the end of May or early June before you can plant. Although it is too late for this year, perhaps a photo of home-grown tomatoes can inspire you for next year. Using a good-quality growbag is the easiest way and in the picture you can see that I use metal supports for the canes and put in two empty pots between the plants to make watering and feeding so much easier. Note also that you can buy growbag-sized trays so that if you are growing in a conservatory you won’t get water running across the floor. There are now available reusable growbags in a woven material that can be washed and refilled each year. For success you must ensure the compost does not become waterlogged, so make a few slits in the bag about an inch up from the floor. I prefer to grow climbing plants rather than bush varieties and this means you regularly have to remove side shoots and tie the stems to the canes. Also, once the first fruits have set, in addition to regular watering, do give a liquid tomato feed every week. 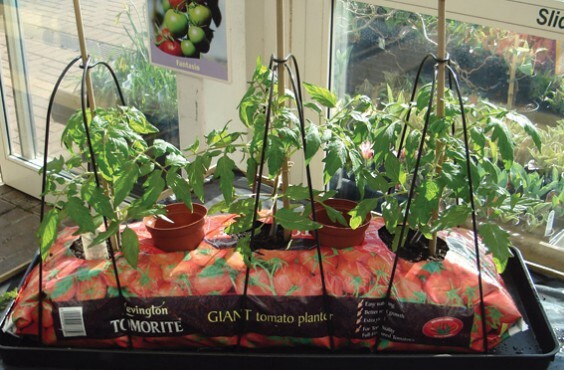 If you don’t have room for a growbag, how about a trailing tomato in a hanging basket? The variety ‘Tumbling Tom’ is great but there’s also one called ‘Peardrop’ which has a pear-shaped yellow fruit with a lovely sharp flavour. If you are already growing tomatoes in a growbag you will be picking fruits till the end of September, possibly October in a greenhouse or conservatory. You could just add the contents of the bag to the garden, but why not reuse it? I cut out the tomato roots, remove the polythene top to the bag, add some chicken pellet fertilizer and plant up with winter hardy lettuce. You can raise you own plants from seed sown at the end of August. Last month we started harvesting new potatoes. A few “seed” of an early variety (I use Rocket) were purchased just after Christmas and placed in egg trays until they had half-inch shoots. While you can buy reusable woven potato sacks, I just use an old compost bag with some holes punched in the bottom. Five sprouted seeds were placed on four inches of compost in the bottom and covered with another four inches of compost. The bag was then placed in a frost-free greenhouse but a conservatory or porch would be fine. As the shoots came up through the compost, I kept re-covering with more compost until the bag was nearly full. By May it was safe to move the bag outside. Do you fancy some nice fresh finger carrots for Christmas dinner? An old plastic pot, 12 to 18 inches in diameter, is ideal. Make sure that there are some drainage holes in the bottom. We always used to put crock (broken clay pots) over the drainage hole but broken-up polystyrene packing will do fine. During August, fill with compost to within an inch of the top, level up and firm gently. Sow carrot seed thinly over the surface. I used the variety ‘Ideal’ and covered with a sprinkle of sifted compost. The pot was left outside, being careful to make sure it was not allowed to dry out. As it is a late sowing and the seedlings are raised in a pot they don’t get attacked by carrot root fly. In July there is still time to grow some French beans in pots. Prepare a pot as for sowing carrots but this time the seeds need to be pushed into the compost by about half an inch. By the autumn you will be harvesting handfuls of lovely fresh beans. If you would like fresh salad leaves throughout the winter, it’s really easy if you have a conservatory, porch or unheated greenhouse. All you need is a couple of washing-up bowls. Drill some holes in the bottom of these for drainage. Again, put a layer of gravel or broken-up polystyrene across the bottom. Fill the bowl to within two inches of the top with a multipurpose compost and sow with your choice of salad leaves. Garden centres and seed firms offer several different seed mixes. If you sow bowls at six to eight-week intervals this will keep you supplied with fresh leaves. In a similar way to the mixed leaves, spring onions are really easy. I use an eight or nine-inch pot and sow a pot every two months. In the winter I keep them in an unheated greenhouse but if you use a winter hardy variety you can keep the pot in a sunny sheltered spot outside. If you have a little more space you can always build a raised bed or two and increase your productivity, but that’s another story. Do give container growing a try.